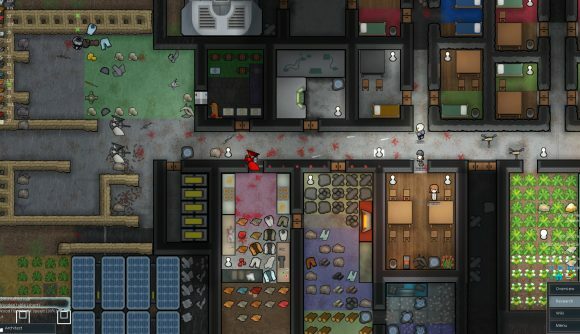 Despite what long-time fans (such as this writer) have assumed about this much comelier version of Dwarf Fortress for years, RimWorld is about to launch its 1.0 version, and they’ve even set a date: October 17. For the uninitiated, RimWorld is about managing a colony of spaceship crash survivors – mostly, you watch as their mental states deteriorate based on the priorities you set for them. Have the settlers set up nicer rooms, and they get better sleep, and then you can have them out on patrol for more gruelling shifts. It’s a game where you can’t ever help but feel like the most monstrous of parents. That out of the way, developers Ludeon Studios are ready to put a fork in this thing. “After five and a half years of development we’re coming to the close of this chapter of RimWorld,” they write in a forum post dated earlier today. RimWorld had sold more than a million copies when we last checked at the beginning of the year. As noted above, RimWorld’s long-awaited 1.0 version comes out on Steam October 17. It’ll run you £23.79 / €27.99 / $29.99 USD, depending on which part of the planet you find yourself on.